Thank you in advance for your help, we have a 2013 Fleetwood Jamboree 31M that we have had out several times and never had a problem with but last weekend was the first time we needed our air conditioning on all of the time due to the 90 plus degree temp and humidity. We were at a campground that we have visited before and even used the same campsite 2 weeks prior without this problem. We were hooked up to the 30 amp power at the campsite and when we unplugged we noticed that the plug prongs were discolored and the plastic melted around them from the RV plug casing (no extension cords used). Was this caused by the air conditioner running all weekend? My husband asked me if I had used my blow dryer or microwave along with the A/C being on and I did use the microwave for 5 minutes the night we arrived. We noticed no electrical problems in the house during that weekend or after we got home and plugged in. ANSWER: Hi Margitt thanks for submitting your question on our Ask An RV Question Page. plug. If the voltage becomes really low it can damage your RV's appliances. It is not uncommon to have low voltage issues at RV Parks. Using a Plug In AC Voltage Monitor in your RV will let you know right after you plug in at a campground whether you have a high or low voltage problem in the Shore Power connection you are plugged into. 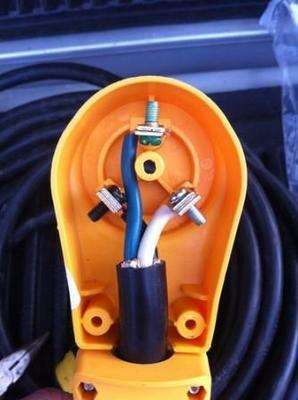 Corroded or Loose Connections in the RV plug or shore power receptacle: These corroded or loose connections can cause electrical arcing which can produce excessive heat causing damage to the plug as well as the power cord itself. 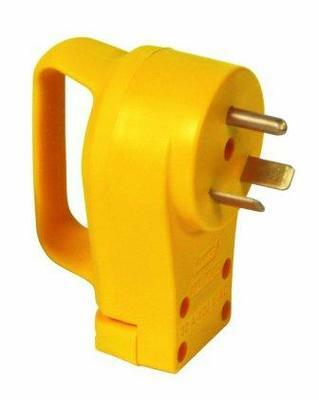 If your 30 Amp plug is damaged you should get a Replacement 30 Amp Plug such as the Camco 30-Amp Power Grip Plug pictured at the top of this page. The second picture at the top of this page shows how simple this plug is to wire. When you are replacing the plug make sure that you inspect the wiring in the cord itself to make sure there was no damage. My wife and I are a couple of crazies that decided to winter camp in Northern Michigan this year. We have been having a LOT of power issues. We dropped from 240 to 120...then nothing at all. We had a technician come out and test everything. Turns out the plug into our unit was loose and he simply twisted it and boom...back in business. The threaded ring on the cord was broke and so the plug was not tightly secured to the outlet. Yesterday morning we lost all power. I checked the plug and the red wire connector was completely fried on the cord. I removed the outlet to find the housing for the outlet broken into pieces and the wires corroded. I replaced the outlet and the cord this morning and all is well so far. Is it possible that all the electrical issues we have been having stem from our outlet being faulty? We have been running a lot of electric heaters and pulling a lot of power. When I replaced the outlet I filed down all the wires to get rid of the oxidization. (I'm guessing green copper wires is not a good thing?) Any thoughts? I read the info RVing Al put on regarding a 30 amp plug end melting do to rv parks low voltage rather than running too many appliances at the same time. I am wondering how this plays on our 2001 fleetwood discovery. It is a 30 amp, we have two roof ac units that I believe pull 12.5 amps. We have melted atleast 4 plug ends in the last 3.5 years. The last one was pulged into a $300 protecter, melted it also. At the time the error code on the protector was 0. In our coach from the factory there is a switch that has to be switched from the hot water tank to the microwave so one can’t pull too many amps. When both ac are running my question is what happens when the hot water tank comes on or the microwave. Saying all that it seems if there were a problem it would pop a circuit no melt a cord. Any suggestions?